The St. John’s Caps of the Avalon East Senior Hockey League (AESHL) advanced to the Herder Memorial Championship with a 4-2 win over the North East Eagles. The entire AESHL finals were intense with the Caps the first two games, followed by the Eagles winning the next three games before the Caps tied the series at 3-3 forcing the crucial game 7. Ryan Walsh got the scoring started for the Caps at the 3:02 mark of the first period, allowing the Caps to take a 1-0 lead into the dressing room after the first period. Jeremy Barron of the Caps made it 2-0 with a power play goal in the second period. The Eagles closed the gap to 2-1 When Mark Chaplin scored. The Eagles tied the game at 2-2 when Andrew White scored on the power play at the 18:59 mark. Brandon Fewer scored in the third period to make it 3-2 and despite a great effort by the Eagles, they could not tie the game. 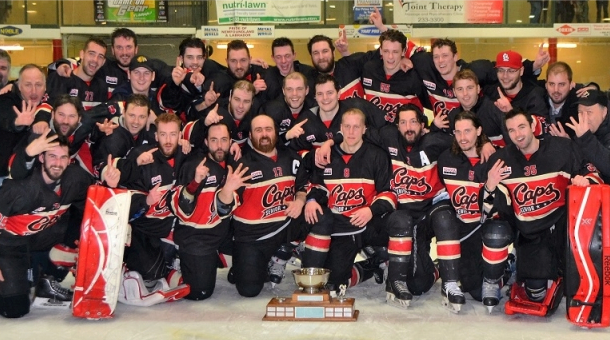 The Caps scored and empty net goal to take the 4-2 win and advance to the Herder Memorial Championship against the Grand Falls-Windsor Cataracts. The first game in the best of five Herder final will be played Saturday night at the Joe Byrne Memorial Stadium with game two Sunday also in Grand Falls Windsor. The series will then shift back to the Jack Byrne Arena the following weekend.